Liam Brady was last seen at about 6.00p.m. 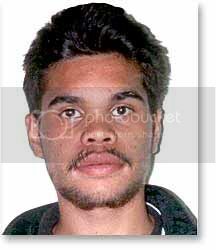 on Thursday 3rd of February 2000, in Amata S.A.
Liam is described as: male Aboriginal, 87kgs,178 cms, scraggly black hair, stocky build, brown eyes and clean shaven. Liam has tattoos on his lower left arm on the front. He has a psychiatric disorder and was taking medication. An aerial search was conducted around the Amata and Marla areas without success. BankSA Crime Stoppers: 1800 333 000.